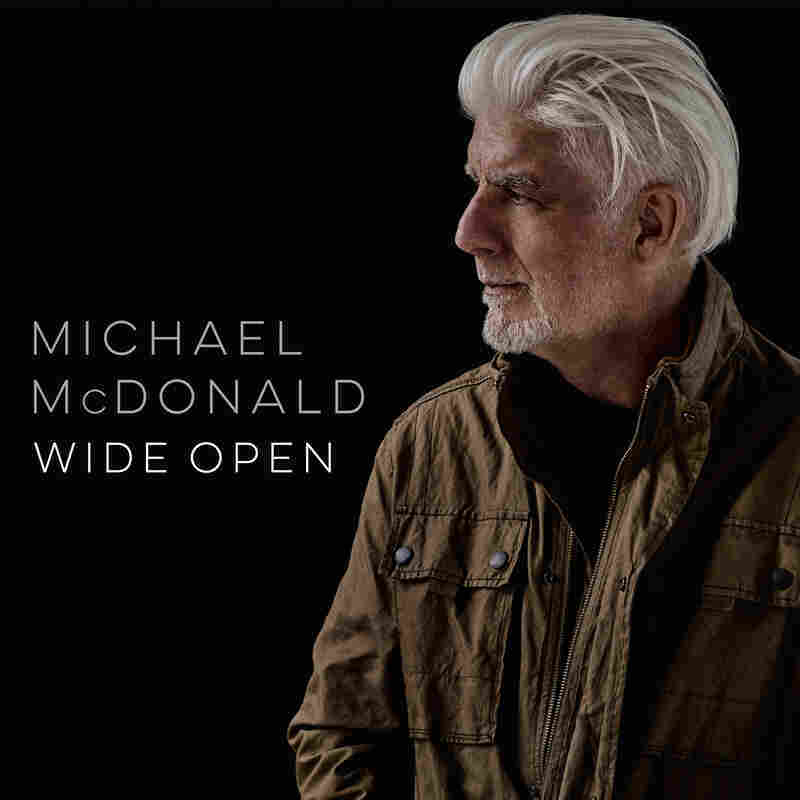 Stream Michael McDonald's New Album, 'Wide Open' In his first album of original material in 17 years, the erstwhile Doobie Brother moves with a tenderness that comes from age and newfound wonderment, even if McDonald's voice hasn't aged a day. Stream the iconic singer's first album of original material in 17 years. Michael McDonald still plays county fairs and casinos. That's no knock — just honest work for a singer 40-some years into a storied career. But the erstwhile Doobie Brother's work isn't confined to fairgrounds these days. In recent years, McDonald has found younger, vocal fans in musicians like Thundercat (who tapped McDonald to co-write a song with Kenny Loggins) and Solange (who sang "What A Fool Believes" in a live duet), and countless others who understand that a gruff voice hugged around the edges is guaranteed to make your day better. "His singing is so specific, and it has so much depth," Thundercat told the Los Angeles Times. "Michael is such a stark example of staying honest and open in your music." Thankfully, McDonald is taking advantage of his moment in the zeitgeist with Wide Open, his first collection of new music in 17 years. After a trio of Motown and soul cover albums nine years ago, this is McDonald's first record of original material since 2000's Blue Obsession. He's since been plenty busy touring with Donald Fagen and Boz Scaggs, and Toto, and even appeared on a Grizzly Bear B-side. Straight up, though: Michael McDonald's talent has never wavered. It just took some of us some time to finally come around to his charms. Much of the man's legacy had been reduced to a throwaway joke thanks to the 2005 film The 40-Year-Old Virgin, its effects lingering long past its punchline. Much like how merlot sales dropped after Paul Giamatti's exasperated line in Sideways, or how Family Guy's one-note Randy Newman bit reduced a songwriting treasure to a trope, the nuance and context of a cultural cornerstone were stripped of a refined singer and, it should be noted, an incredibly sophisticated songwriter. Wide Open's opener "Hail Mary" doesn't waste any time reminding you what McDonald does best: set a mood as smooth as a spirit's wing. Larry Goldings' B3 organ hums under Drew Ramsey's gliding guitar work and the crisp drumming of Toto's Shannon Forest, who also produced the album. "What really lies at the heart of a memory / The power of one moment in time," McDonald sings, breaking each word into regrets written written on slips of paper, dropped into vapor. It's a slow burn at nearly seven minutes, cresting with harmony vocals from McDonald's wife Amy Holland, and a saxophone solo from Mark Douthit. This is Michael McDonald, after all. But apart from McDonald's voice, 12 songs clocking at an average of five minutes each and Shannon Forest's careful ear, not much else ties Wide Open together stylistically. Jump back to those Motown albums and there's a jubilant theme to its selection, or even as far back as the 1982 solo debut, If That's What It Takes, and you can hear L.A.'s feathered boogie throughout. But here, McDonald pulls from country music, R&B, soul, soft- and classic rock with decades of American pop wisdom. The guest spots are top notch, too, from the likes of bassists Willie Weeks ("Just Strong Enough") and Marcus Miller (the incredibly smooth "Find It In Your Heart," the oh-so funky and fun rave-up "If You Wanted To Hurt Me"), guitarists Warren Haynes and Robben Ford (both on "Just Strong Enough," a B.B. King-style blues swept up in strings), saxophonist Branford Marsalis ("Blessing in Disguise") and keyboardist David Paich. Tracks like "Half Truth" and "Blessing In Disguise" are not only markers of McDonald's ear for complex arrangement but also a bit of a nod to how music has simultaneously moved forward and cycled back. Written with his son Dylan McDonald and Grady Walker (whose co-songwriting credits date back to If That's What It Takes), there is a rough sheen to "Half Truth" that could easily translate to someone like Kenny Chesney and his penchant for soaring country ballads that still cling to a little grit. Alternately, "Blessing In Disguise" is a dense piece of soft-rock-fusion, aided in no small part to Branford Marsalis' snaking saxophone but also smart synth and drum programming that borders on the obtuse pop-noir of David Sylvian. When it comes down to it, a Michael McDonald album is a Michael McDonald album. You want songs about heartbreak and regret wrapped in that sui generis tenor and warm Rhodes — and he doesn't disappoint. But there's a profound sense of hindsight to Wide Open that moves with a tenderness that comes from age and newfound wonderment, even if McDonald's voice hasn't aged a day.